With the sub-zero temperatures of the past few weeks, Fairfielders have mostly been hunkering down inside. A brave few have traveled to the slopes to ski. 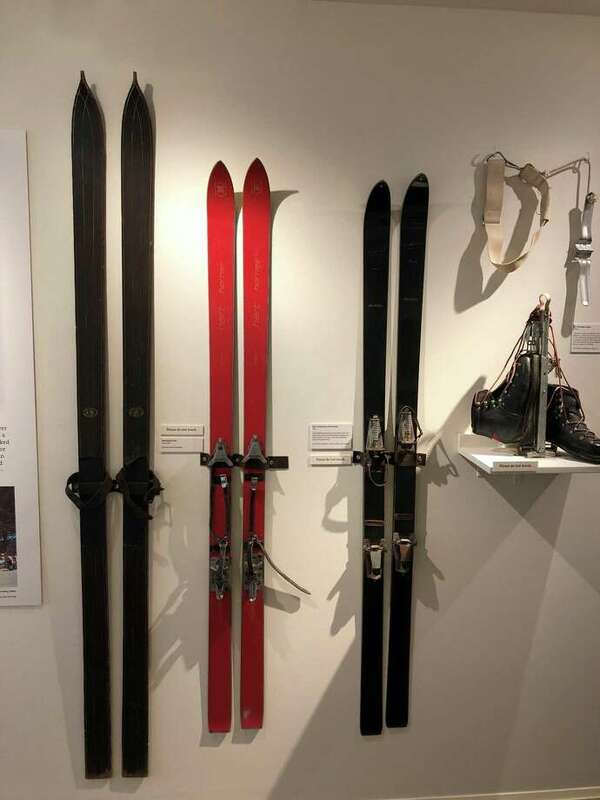 The Fairfield Museum’s Winter Wonderland exhibition features sleds, clothing, ice tools and a variety of vintage ski equipment. Skiing is a relatively new winter sport in New England. While immigrants from Sweden and Norway brought Nordic skiing to the Midwest in the mid-1800s, downhill skiing did not take hold in the northeastern U.S. until the 1920s, inspired by the growing popularity of skiing in the Alps. Following the 1932 Winter Olympic Games, held at Lake Placid, N.Y., downhill skiing spread to the mountains throughout New England. The first rope tow, a contraption powered by a Model-T Ford truck, was set up in 1934 on a slope at Clint Gilbert’s farm in Woodstock, Vt. Skiing became a popular pastime at Mohawk State Park in Cornwall, Conn., when in 1939 the Civilian Conservation Corps built the first downhill trail on the mountain. In the mid-1940s, Walter R. Schoenknecht leased the northwest side of the mountain from the state and developed a ski resort which attracted winter sports lovers from all over. When faced with below-average snowfall in 1948, Schoenknecht partnered with the Tey Manufacturing Company to create a snow-making machine — the first documented machine-made snow for skiing. Fairfield resident Serge Gagarin was an engineer at Sikorsky Aircraft and an avid skier who was a regular at Vermont’s Stowe Mountain. He worked with other former Sikorsky engineers who were developing a hollow, all-aluminum ski. Gagarin established his own distribution company and took the design to Europe, where it was manufactured and sold as the Aluflex ski. Learn more about winter sports and the history of Fairfield’s winters at Winter Wonderland exhibition. It runs through February 19 and is open daily 10am-4pm. About the Fairfield Museum & History Center: The Fairfield Museum & History Center and Museum Shop, located at 370 Beach Road, is open seven days a week, 10am-4 p.m. Members of the museum and children under 5 are admitted free. For more information, call 203-259-1598 or visit Fairfieldhistory.org. The Fairfield Museum relies on funding from individuals, corporations and foundations. The Museum is especially grateful for leadership support from the State of Connecticut, Town of Fairfield and Fairfield County’s Community Foundation.